Rescue Belts are constructed of 1.75" Mil-spec type 13 webbing with 7,000 lb. tensile strength. Buckles are Mil-spec forged metal. 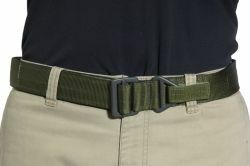 The belts are fully-adjustable, available in four sizes (below).